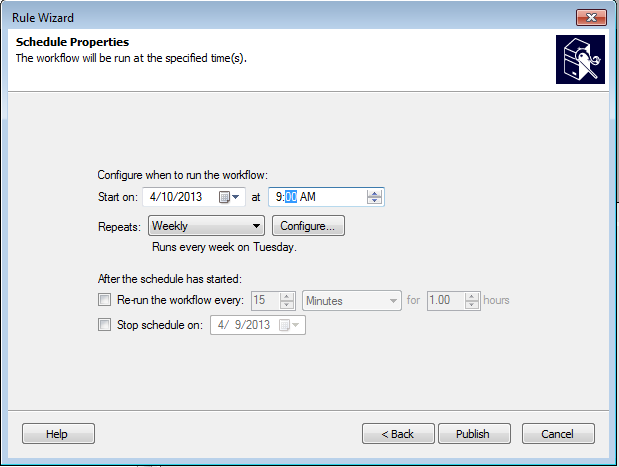 Business processes in Laserfiche Workflow are workflows that provide information to individuals involved in the process via instructions, notifications, and reporting. Instructions reduce the need for training by providing the user with the information necessary to do his job, notifications ensure that deadlines are met and reporting allows the manager to view the user’s actions and the business process resolutions. An existing workflow can quickly be converted into a business process by following the steps outlined in this “Introduction to Business Processes” video. This article contains ideas for implementing and using business processes within any organization. Note: this article only applies to business processes in Laserfiche Workflow, not processes in Laserfiche Forms. As part of a process, a document is routed to the HR assistant for review. The HR assistant has been recently hired and isn’t sure what she is supposed to do with this particular document. Placing the document routing activity inside a Workflow Business Process Step activity will provide the HR assistant with specific instructions for how to process the document. An HR manager needs to find all documents related to candidates who are in the process of being interviewed. Creating an HR onboarding business process and including an Update Business Process activity will allow the HR manager to search on the business process status in the Laserfiche Client or Web Access to find all the documents for candidates taking part in the interview process. The HR recruiter reviews a large number of job applications and resumes each day. 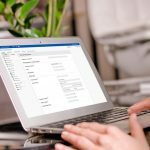 By converting the HR onboarding process workflow into a business process, the HR recruiter can get a daily “task list” email that details all the documents she has to review. Not every workflow needs to be converted into a business process. 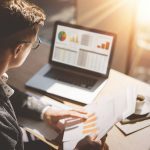 Since business processes allow administrators to run reports on user actions, if a workflow does not involve people, making it a business process has little benefit. An exception to this is if it is necessary to monitor how long some potentially slow or problematic activities run. Use tokens in the step resolution to make the resolution as informative as possible. For example, if a business process step deals with screening a prospective employee, the resolution may include tokens for the name of the HR recruiter who screened the candidate and the date/time this task was completed. 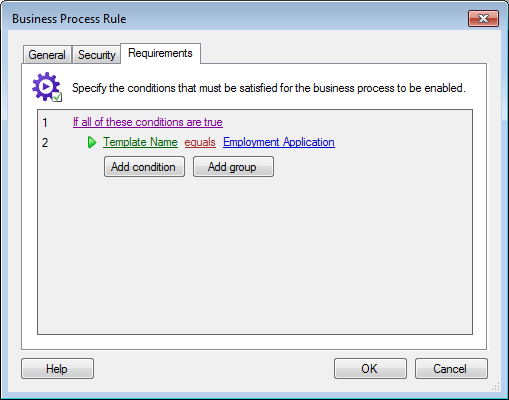 Include at least one wait condition inside the business process step. Without a wait condition, it is impossible to report on the action of a particular user since the workflow will continue past the step before the user can act. 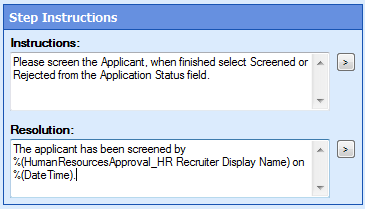 For example, in the “Human Resources Approval” business process step, the Wait for Entry Change activity waits for the HR Recruiter to update the value of the “Application Status” field before moving on to the rest of the business process. Update the business process’s status throughout the business process with the Update Business Process activity. This allows for more accurate reporting (described in the “Introduction to Business Process Reporting ” Solution Exchange article). Be aware of the difference between a business process step due date and a Deadline activity. A due date by itself is a recommended date/time by which the task should be completed. A due date’s only function is allowing for reporting and email notifications. For example, if the task is not completed by the due date then the user will continue to be reminded that work is overdue. A manager will also be able to run a report on all tasks completed after the due date. A Deadline activity runs a different set of activities after a specific date. In order to get the due date to match a deadline, it is possible to sync the business process step due date with the Deadline activity. For example, the HR Recruiter has three business days to screen the applicant. If the applicant is not screened by then, the resume is moved to the HR Manager’s folder and the manager is notified by email. Configuring a due date of three days will send the HR Recruiter an email when the due date is approaching. Including a Deadline activity in the Business Process Step activity and syncing it with the due date allows for the other activities to occur. 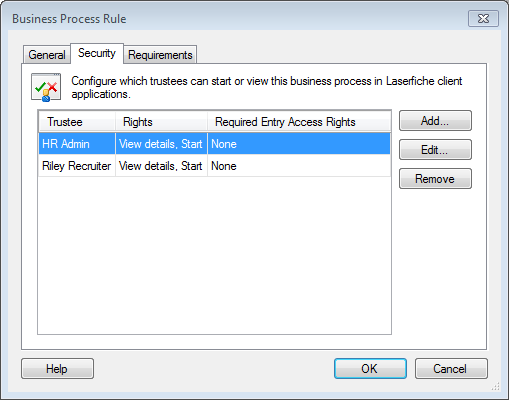 A user can select the entry he wants the business processes to use, and then click a button in the Laserfiche Client’s or Web Access’s toolbar. 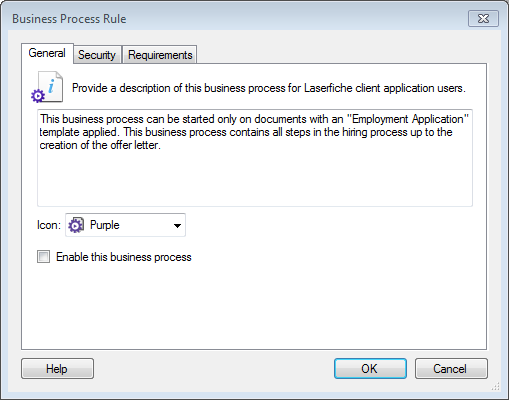 He can also initiate the business process from the Start Business Process dialog box in the Laserfiche Client, Laserfiche Web Access, or Laserfiche Mobile. On a schedule or with a condition starting rule. By another workflow or business process. From a Laserfiche Forms process or submission. To make sure a business process is only launched on correct entries by authorized users, configure a Business Process Rule. This rule specifies who has rights to view and start the business process and what conditions must be met before those users will be allowed to start it. After the interview, if the manager decides to offer the employee a job and changes the “Status” field on the resume or application to “Pending Hire,” the “Create Offer Letter” business process is launched by an Invoke Workflow activity in the existing HR onboarding business process. Once the employee is hired, he must fill out a benefit enrollment form in Laserfiche Forms. Each week, a business process in Workflow sends a list of completed forms to the HR assistant. Since the HR assistant takes care of benefit enrollment once a week, this business process is configured to run on a schedule. Thinking about implementing Laserfiche in your organization? Request a free demo here!